A new line of quick connect attenuators is made up of 31 models that support operating frequency ranges from DC to 6 GHz. 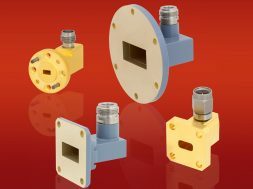 These attenuators are available with QMA, QN, or 4.3-10 connectors for easy mating. They feature VSWR as low as 1.15:1 and attenuation values from 0 to 20 dB. The 4.3-10 attenuator models deliver low PIM performance and have power handling up to 15W maximum. These quick connect attenuators increase installation flexibility with an easy, screw-on design that allows for hand-tightening and eliminates the need for wrench or torque for coupling. The 4.3-10 attenuators are made of anodized aluminum. The QMA and QN models are constructed of brass tri-metal. These attenuators are ideal for telecommunication, industrial, defense, and aerospace industries.